Did you ever have a Pollyanna? A secret pal back in the days when mail traveled only in paper envelopes with postage? As I was going through one of my Boxes under the Bed, I found this quaint gem sent to me at college in celebration of St. Patrick’s Day, March 17. The charming card is signed Pollee Ann, obviously a reference to the main character in the children’s book series Pollyanna by Eleanor H. Porter, who finds the glad in everything. Though she was tragically orphaned and sent to live in the home of her gruff Aunt Polly, 11-year-old Pollyanna has come to represent eternal optimism as she spreads cheer, sometimes secretly, all around town. Have a Zippy St. Patrick’s Day! Some celebrate St. Patrick’s Day by baking/eating cupcakes or cookies with green icing or wearing a shamrock pin. How do you celebrate St. Patrick’s Day? Is there Irish in your heritage? I just reread Anne of Green Gables by L. M. Montgomery last summer and was struck by how similar the two books/characters, Pollyanna and Anne… are. They started a popular genre back in the day of writing works where young girls are the heroines. I do not have Irish in my heritage but I do have Scotch. My mother\’s family immigrated from Scotland to Scotch Settlement, New Brunswick. LM Montgomery was from Prince Edward Island not far from there. I\’m kind of answering your question by coming in through the side door. Happy St. Patrick\’s week to you, Marian. I like entrances by the side-door, Georgette, especially you are the first commenter today. Little House on the Prairie also comes to mind, and further back, Alcott\’s Little Women. How interesting that you can trace your ancestry on a path from Scotland to the brave new world. 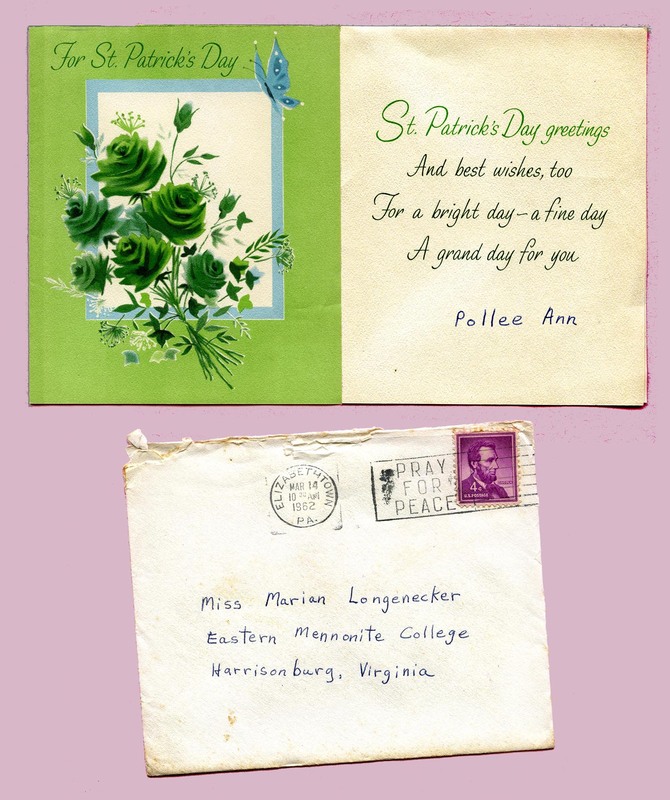 How sweet that you received a St. Patrick\’s Day card from Pollee Ann! Did you ever find out who she was? I\’m certain I found out who she was, but I don\’t remember now. It had to be someone from my church: I suspect Miriam Hess. My elementary teacher/aunt always made a big deal about any holiday. Looking back, it seems odd that a Mennonite teacher in a predominately German-Swiss community would be so bowled over by St. Patrick\’s Day. (Yes, one year she had us wear green bowler hats.) She just couldn\’t suppress her love of beauty, color, and pageantry of any kind. No, I don\’t particularly like green icing – ha! I loved the Pollyanna books when I was growing up. I loved her positive attitude. We took a walk along a marina the other day and found a boat called Pollyanna! Neither of us are Irish, but we will enjoy the festivities here in Spain as there are many Irish people living in this part of the coast. Wish I could include a picture on here of the boat. Perhaps I can email it to you. Yes, there is a whole genre of wholesome books extolling spunky girls with wholesome character. Little House on the Prairie comes to mind here and earlier, Alcott\’s Little Women. I am sure you are reveling in all the bright color and sounds of Spain. Thanks for sending the photo – and thanks for commenting too, Darlene. I have posted Darlene\’s Pollyanna boat on my welcome page! Love your keepsake card complete with the envelope and postmark, in light of no zip code! Secret friends were a lot of fun–haven\’t participated in that kind of thing for many years! This year our pastoral care team has planned a little party for residents of the Presbyterian retirement community who go to our church (which is quite a few) so I had the fun of picking out decorations and party favors on the church\’s dime.) One planner said to make sure not to slight the \”orange\” (Protestant) part of the Irish flag so I bought orange beads too. For what that\’s worth!! India has the same colors on its flag with the stripes displaying horizontally rather than vertically like the Irish flag. You never cease to amaze me. I\’ve always heard the term Pollyanna and participated in it at work on different occasions but never knew the story behind it. I have to find the books for my grandchildren after I have read them lol. Here in Chicago today we have a parade. I no longer run to it but my children still do. Nikko is home on spring break and left last night to the city to celebrate with friends. The girls are going to meet up with him at the parade. Two of my grandchildren are going camp for the weekend. Waiting for Pablo and Imani to wake up to go out. I feel like a child right now waiting. I can sense your enthusiasm as I read about your meet-ups with family. I\’m guessing Chicago is warming up a little bit. Happy Saturday, Gloria. So the Archers came from Ireland – neat! Yes, I do remember now that you mention paying attention to wearing green too so I wouldn\’t get pinched! Yes, Archer is an Irish name or Scottish. I was referring to my dad\’s family. My great-grandparents, William and Jane (Ramsey) Williamson came from Ireland. They buried their first baby in Belfast, Ireland. Okay . . . I seem to remember that you also have Norwegian in your family line too. Right? You\’re right! My father\’s side is Irish. My mother\’s side is Norwegian. Marian — This post brought back fond memories of having a secret pal, too! And it makes me remember how much I enjoy receiving real, honest-to-goodness, handwritten letters. Extremely few and far between these days. I always wondered about the difference between the Mc and the Mac in last names – thanks for the brief tutorial, Laurie. I can\’t wait until Tuesday! My father\’s father was half Irish, Half Cherokee. My grandmothers family worked hard to over look it. An ethnic mix makes for a stronger breed, so they say. Cultural differences run deep though – just look at the headline news! Thanks for stopping by, Susan. At school, teachers brought in a pot luck lunch to celebrate St. Patrick\’s Day during a professional development day. There were plenty of green cupcakes and Irish-themed food. Here in Jacksonville where there is a hefty Irish-American population, the grocery stories are touting specials on an \”Irish\” menu of corned beef and cabbage. Also, Irish Shepherd\’s pie is another stand-by. Somehow I don\’t like green in my food unless it\’s of the naturally green vegetable variety. My grandmother was Irish ,but I have no idea about my family before her , be interesting to find out . I don\’t normally celebrate St Patrick \’s Day ,other than a glass of the \’black stuff \’, but this year I might make an exception. Where I used to live in Birmingham there was always a Celebration on St Patrick\’s Day Birmingham had a large Irish community. I always look forward to your \”take\” on the topic. You know we have a Birmingham here in the state of Alabama – lots of family names of Irish origin there too. Happy St. Pat\’s Day! As you may know, I live in a neighborhood with Irish street names – Leprechaun Court, Emerald Island Circle, and so on. There are a few Irish families here, and we did have a community social two years ago with a green theme. I have 1-2 shamrock pins, but have never dyed milk green. I agree with Little Guy – it probably looks gross. Oh, I remember the good ole days of pen pals! It must have been a world-wide sensation in the 1950s and 60s, Yes? Thanks for commenting, Fiona. Commanndo\’s grandad was Irish which is why we have a Declan and a Shaun, although they\’re not named in my blog of course. Many Americans go wild over St. Patrick\’s Day, even those that don\’t have an Irish heritage. It\’s deeply embedded in our culture and their are parties, parades, and special observances all over the country. Any excuse to celebrate! I don\’t think I have a drop of Irish (or English) blood for that matter. My ancestors emigrated from Switzerland and Germany in the 1730s. We have Shauns and Seans here, but I don\’t hear the name Declan very often. I always enjoy your comments here, Marie. Loved this thank you Marian! Pollee Ann – perfectly whimsical. I\’m so glad you like the topics, Susan. Though we are hemispheres apart, we have much in common, including a language we share with Scots, Irish, Welsh – and English, of course! Marian , it sounds like we have the same background. I have a pen pal named Monica and she lives in Zurich. She is a niece of my mother\’s cousin Elsa , cousin being quite removed. We were set up back when I was 14 so that she could practice her English and I , my German. We still write, though of course by email now. We have Secret Sisters at church…We are to pray for and encourage her throughout the year. We have a mailroom at church where everyone has a slot to slip in notes, treats etc. Yes, our pen pals, and Pollee Ann\’s turned into Secret Sisters. I hope you keep up this tradition at church – a personal note of encouragement goes a long way to batting down the blues. Thanks for commenting here, Athanasia. And that temper (I\’m going by what you say here!) has given you courage and resolve like no other. My nod to St. Party\’s Day this year was a leprechaun wreath on my front door. I even forgot to wear green, but no one pinched me! Lol, Marian. It seems that you have a good handle on me. 🙂 I didn\’t wear green either, and sadly, nobody pinched me.